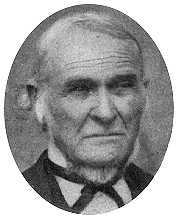 Joel Hills Johnson and Anna Pixley Johnson had four children besides the Sariah Anna whose history is here being biven. They were Sixtus, Ellis, Nephi, Susan Ellen, and Seth. The Mother, Anna Pixley Johnson whose name before and after marriage was Johnson, died 11 September 1840 at Macedonia, Illinois (near Nauvoo). After the Mothers death the Father, Joel Hills Johnson, married Susan Bryant. They were driven around by mobs and Sariah Anna went to live with her Grandmother Julia Hills Johnson. Before the death of her Mother she lived in Kirtland, 0hio until she was eleven years old, (These places are all near the city of Cleveland, Ohio ) ( Sariah Anna was evidently only about eight years of age when her own Mother died. Three of the children were still younger, the baby Seth, less than two years of age. Joel Hills Johnson married Susan Bryant the same year his first wife, Anna Pixley Johnson, died and Susan came into the home to take care of the motherless family. She also raised a large family of her own. The parents of Sariah Anna Johnson had joined the Church before Sariah Anna was born. About the time Sariah Anna was eleven the Saints were all called to go to Jackson County, Missouri. Joel Hills Johnson was a Captain of the Company. They went as far as Springfield, Ohio and there rented a place and stayed for the winter. fier Father and fnmily stayed in a lar;e rotel, but he 'elt impressed to go to Carthage so in February t:e took tis family and moved to Carthage, Illinois, Tt,ere he found many who were anxious to hear the Gospel; and tnany yere baptized. Here her faLher ren~ed a sawmill and worked at that industry and farmed to support his faraily. Sariah Anna Johnaon married John Eager (Eagar) in Salt Lake City on the 1st of July, 1849. She had come West with the Saints in 1848. She had worked in the Nauvoo House after the martyrdom of the Prophet, Joseph Smith. Her father's family were very intimate with the Prophet Joseph so she was well acquainted with him, being about twelve years old at the time of his death. John Eagar was born 13 July 1823. He was a man of education, a printer by trade. He became acquainted with the authorities of the Church in New York City where he assisted in printing a paper for them. He was one of those. who went on the ship Brooklyn around to San Francisco and from there by land to Utah. He died in Manti, Utah on the 3rd of March 1864. Sariah Anna (Johnson) Eagar and her fatherless family went to Utah's Dixie about two weeks after the father's death. She settled in Virgin, having come there with her brother Nephi Johnson. In two days after her arrival in Virgin, she had a home of her own, two "dug-outs". How few of the women of today would be proud to call such a place home. She had left a good home in Manti that had cost them three hundred dollars to make and with her eight children had gone pioneering in the year 1864 when every neccessity was so hard to get. This made sixteen children she had to raise. She was President of the Relief Society about twenty years in Virgin Utah and a Sunday School Teacher for nine years, having given many years of faithful service. They lived in Virgin until about 1908, when they moved to Hurricane, Utah. Andrew Jackson Workman died 15 June 1909. 'Sariah lived alone, only her grandchildren stayed with her at night. One winter Anna (Annie) Covington and Mary (Mamie ) Hinton nursed her through her sickness. She used to love to tell her grandchildren how she used to sit on the Prophet Joseph's lap and he would give her blessings. She also would tell about when she was twelve years old, how she drove a yoke of oxen across the plains in tho Willard Richards Company, when her family came to the "Valley". She said she was at the meeting when the mantle of the Prophet Joseph fell on Brigham Young, and her testimony of the occasion was very strong. She bore a strong testimony of the Gospel as long as she lived. She died 27 March 1925, and is buried in the Hurricane Cemetery.